I recently changed jobs and my previous boss and co-worked knew I was inclined towards the odd board game and role-playing game. They were kind enough to get me some dice and were adamant that they went through no trouble. They told it it was effortless. With this in mind, either I’ve been living under a rock or they tried a smidgen harder than they let on. This is how I’ve discovered DnDice. After perusing the DnDice website it seems fairly obvious that I’ve been missing a serious trick. Dice trays, metallic dice, dice towers, lots of things to make your dice-rolling more enjoyable in your games. They even sell “battle-scarred” dice which are dice that may have printing errors or faults, sold at discount. Nice to see these sorts of things not going to waste. Anyway, moving on. Let’s look at the goods, shall we? We’ll start with the appetiser, the DnDice Mat. Admittedly, this is more of a nice little add-on. The prime purpose is for you to roll your dice on it to minimise noise whilst ensuring weightier dice don’t damage your surface. As someone who just bought a brand new table, this is music to my ears. That mat is soft, fairly light and not too dense, it can be rolled up and stored easily. Available in black with a number of different coloured DnDice logo designs, this is a great “bonus” gift. But for the main course of this written piece, we move onto the Chromatic Dragon dice! To reiterate, I never put too much thought or effort into dice before I received these. But my eyes have truly been opened. Firstly, they are packed in a black tin, decorated with wonderful artwork which adds to an impressive level of product presentation. Not only does this act as something you can carry your dice around it, but they’ll be safe from damage too. The case is lined with some fairly dense foam and cut-outs for each die to go into. 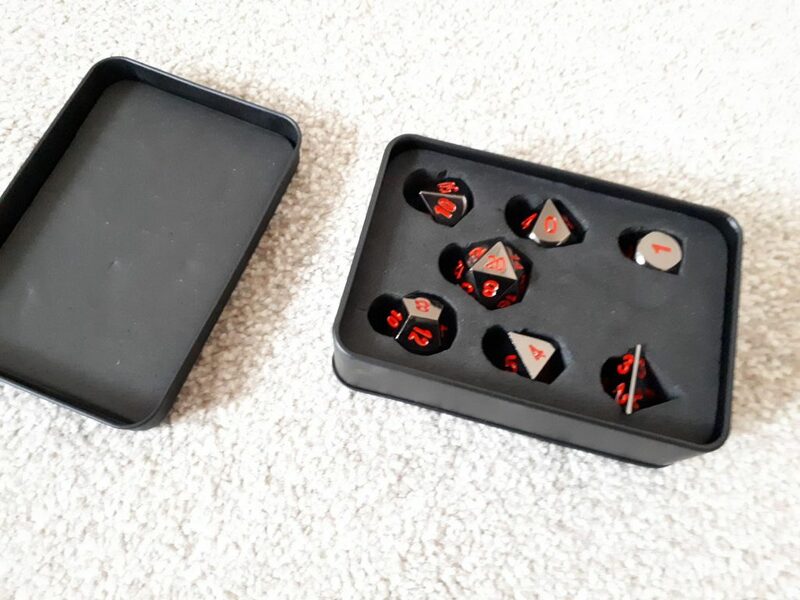 There’s no wiggle room so these dice are staying put no matter what, there’s even a foam insert for the lid. The set I received were the Red Chromatic Dragon set. 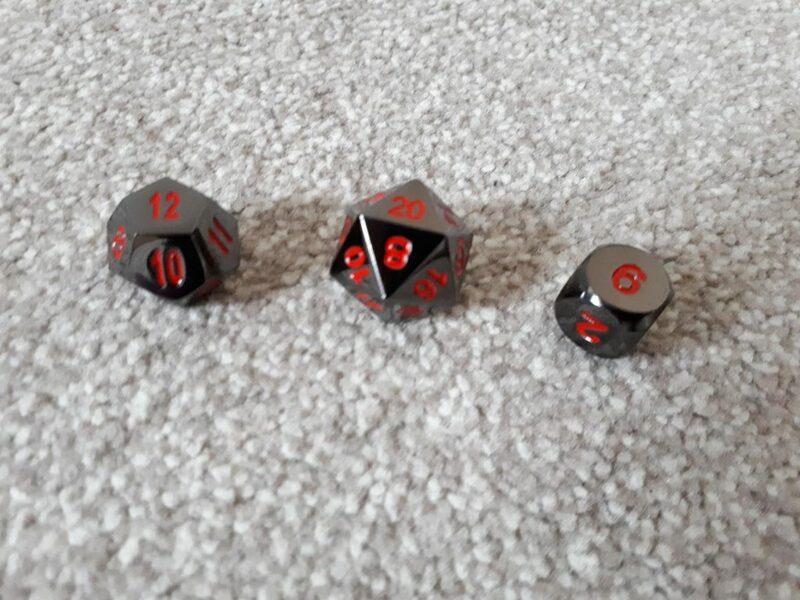 This includes 7 poly dice coated in a dark chrome-finish, the numbers etched in red on each die. It comes with d20, d12, d10, d8, d6, d4 and a percentile die. The dice themselves are incredibly nice to look at, each one reflective yet dark. Suitable indeed for my dark and foreboding games, characters and schemes! They have a very nice weight to them with them being metal. Again, I never thought rolling dice was something that could “feel good”, but these thud and roll with such gravitas I feel each roll becomes more tense and dramatic as I make them. If you’re looking for a more premium product when it comes to dice or an area to roll them in, definitely check out DnDice. I’m shocked I’d not come across them before but I’ll certainly be keeping my eye on them here onwards. 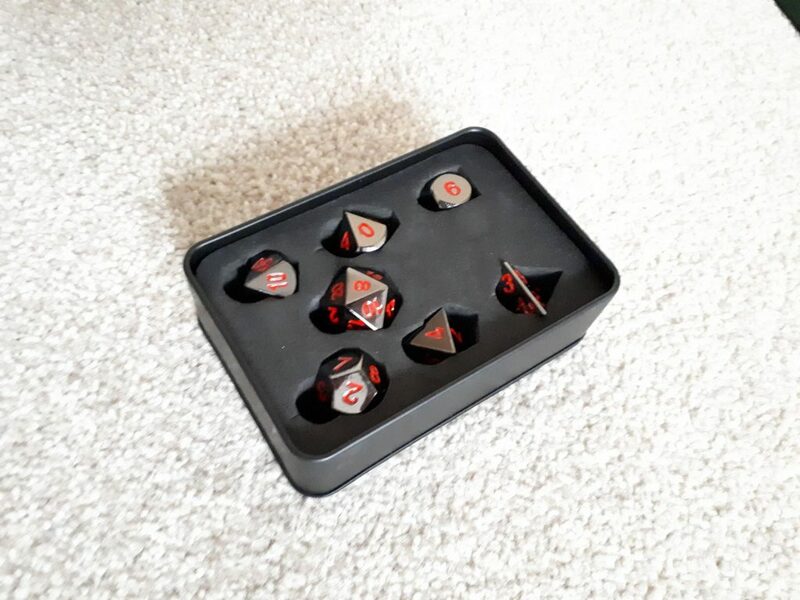 Though, with the Chromatic dice themselves being metal, I’d certainly advise getting a mat with them to avoid damage to them or your surfaces. Looking on the website, the Chromatic Dragon sets come in at around £25, this includes the tin, foam and dice. It’s certainly an amount I never thought I’d spend on a set of dice. However, my mind is certainly starting to sway. If I can only find a batch of d6’s I’d buy them on the spot! If you have a friend who’s interested in RPGs and you aren’t sure what to get them for their birthday, these may do just the trick. As a gift it’s something that shows an understanding of the recipients interests whilst representing great quality, too. As always, check back with us regularly here at TabletopGamesUK for more updates. Be sure to stop by our Facebook too and if you’re headed to Salute 2018 on Saturday, keep an eye out for us!